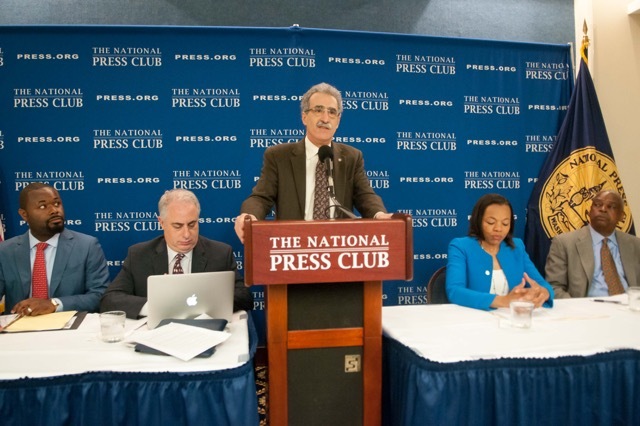 At a panel discussion sponsored by the National Press Club on May 13, APWU President Mark Dimondstein championed voting by mail, which would give more Americans access to the ballot box. This year’s presidential contest is the first national election since the Supreme Court struck down a provision of the 1965 Voting Rights Act that required states with a history of voter suppression to get approval from the Attorney General before making changes to their voting laws. After the 2013 ruling, 17 states rushed to enact laws designed to limit voting, especially among minorities, the young and the elderly. The new regulations include provisions that cut early voting opportunities, imposed strict photo identification requirements, and demanded proof of citizenship – which many citizens would find difficult to do. “All of these would have been blocked by the Voting Rights Act, if not for the Supreme Court ruling,” said Kristin Clarke, president and executive director of the Lawyers Committee for Civil Rights Under Law. Voting rights advocates are challenging several restrictive state laws, including a 2011 Texas law that requires voters to produce photo identification that accepts gun licenses as a valid form of identification but not state-generated student IDs. Of the 1 million registered gun owners in the state, only 286,000 are women and just 67,000 are African-Americans, Clarke pointed out. Voting by mail is one way to protect and expand the democratic right to vote, Dimondstein said. Before discussing its benefits, he highlighted how real voter suppression was – and is. “I am on the Board of Directors of the International Civil Rights Center and Museum in Greensboro, NC,” he said. “One of its exhibits is a real-life example of a voter registration test given to African-Americans prior to the 1965 Voting Rights Act… When my college-educated sister visited the museum a few years back, she could only answer 3 of the 20 questions. This is a stark reminder of how deeply embedded voter suppression is in the history of the U.S.
We are in an era of new “Jim Crow” laws intended to suppress the voting rights of minorities, the poor, the disenfranchised, the working and the elderly, Dimondstein said. Without convenient and fair access to the ballot box, the right to vote “is indeed a right diminished,” Dimondstein added. Part of the solution to voter suppression is to implement across-the-board voting by mail, he said. Creates a paper trail, reducing concerns about tampering with election tallies. Twenty-seven states have implemented voting by mail where no excuse is needed, he noted, and three states conduct elections entirely by mail: Oregon, Washington and Colorado. Mail balloting has proven to be popular: In the 2014 mid-term elections, only 36 percent of Americans voted, the lowest turn-out in 77 years. However, in Oregon, participation was over 70 percent. Sen. Ron Wyden (D-OR) has called for an expansion of the state’s vote-by-mail program to the rest of the country. 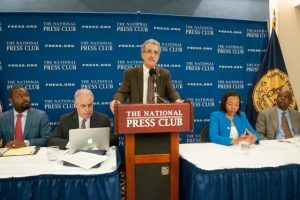 “Vote-by-mail will not solve all the attacks on voting and democratic rights,” Dimondstein acknowledged. It won’t eliminate obstacles to voter registration, for example, but it will counter voter suppression and voting obstacles by expanding access to voting for everyone. Wade Henderson, president and CEO of The Leadership Conference on Civil and Human Rights, agreed. “Voting is the language of democracy,” he said. Henderson compared the low voter engagement in the U.S. to other industrialized countries. Some states have bucked the national trend and changed their laws to expand voting. Cory McCray, a member of the Maryland House of Delegates, led the fight to allow felons who have paid their debt to society to vote. In a tight race, that could influence the outcome of an election, he said. McCray, who represents District 45 in Baltimore, said, “When there is a high concentration of people on parole and probation, like in my district, there are disparities.” His district is a “food desert” because there are so few grocery stores; there aren’t enough firehouses, and just two schools in the district are being rebuilt while five or six schools are being rebuilt in other districts, he said.